With a new baby on the way, my family and I have been trying to fit in as much fun as possible this summer. 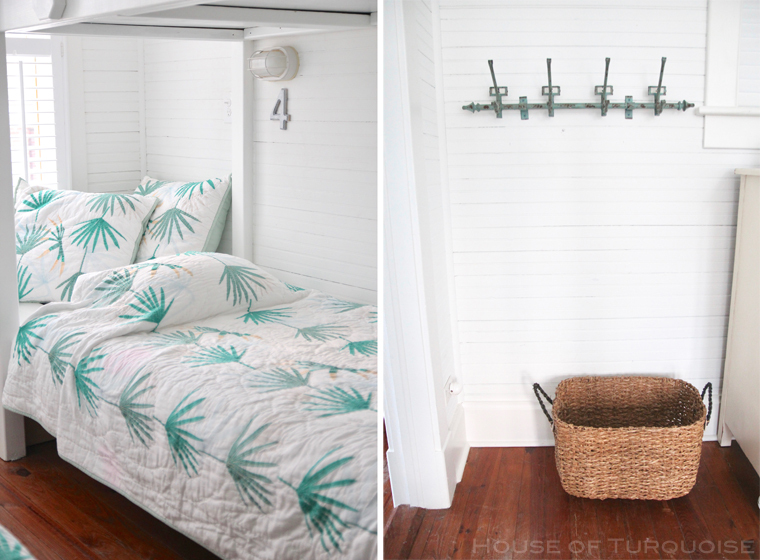 Our favorite adventure so far has been a trip to my happy place–Tybee Island! 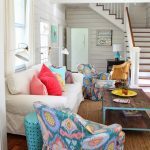 Of course a visit to this quirky little island outside Savannah wouldn’t be complete without a stay at a beach cottage designed by preservationist and interior designer Jane Coslick. 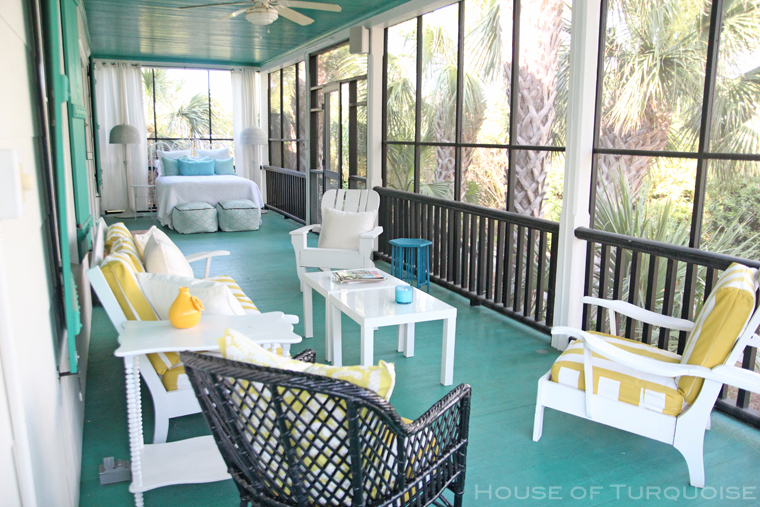 One of her recently completed projects is As Time Goes By–now a vacation rental through Tybee Cottages when the lucky family isn’t using it themselves. 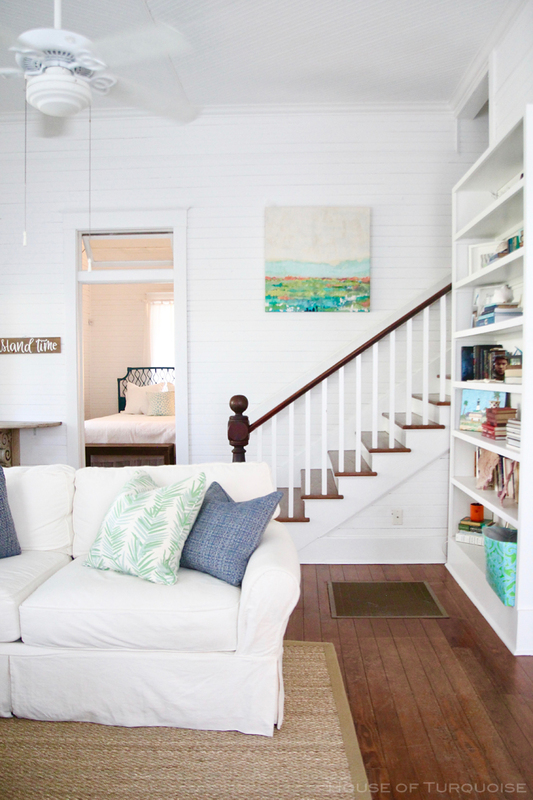 Like all of Jane’s projects, I was immediately transported into the pages of Coastal Living magazine when I opened the door. 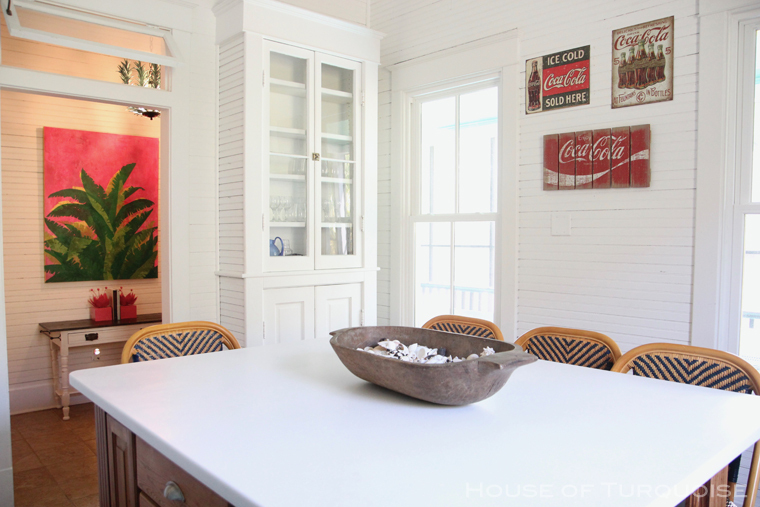 The home itself is gorgeous and filled with historic character…it was built in 1924 and is one of the original Strand Cottages built on Tybee. 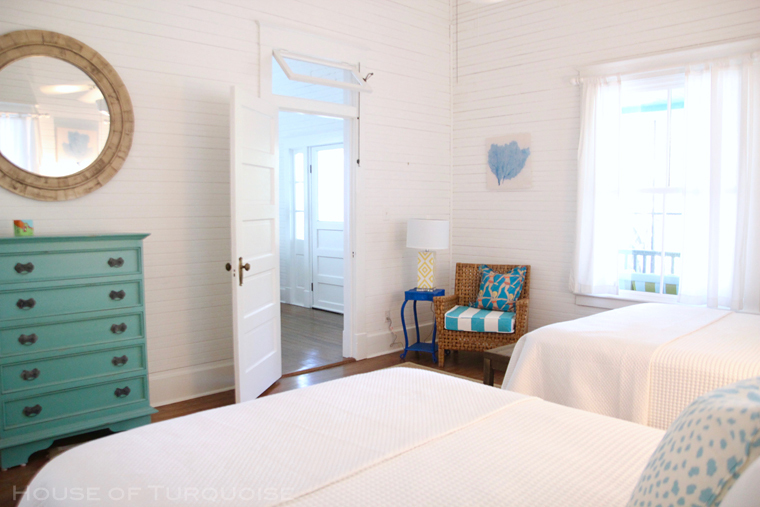 There is no replicating the charming original features like the soaring 14′ ceilings, transom windows, hardwood floors and beadboard walls. 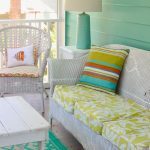 Jane honored the history of the home while giving it a fresh new look with her signature use of splashy color (including plenty of turquoise!) on a soothing white background. She worked her magic throughout, brilliantly mixing high-end pieces with budget-friendly finds and achieving the perfect blend of old and new. Talk about inspiring! I struggled to edit down the number of pictures to share with you guys, so settle in and enjoy the tour! 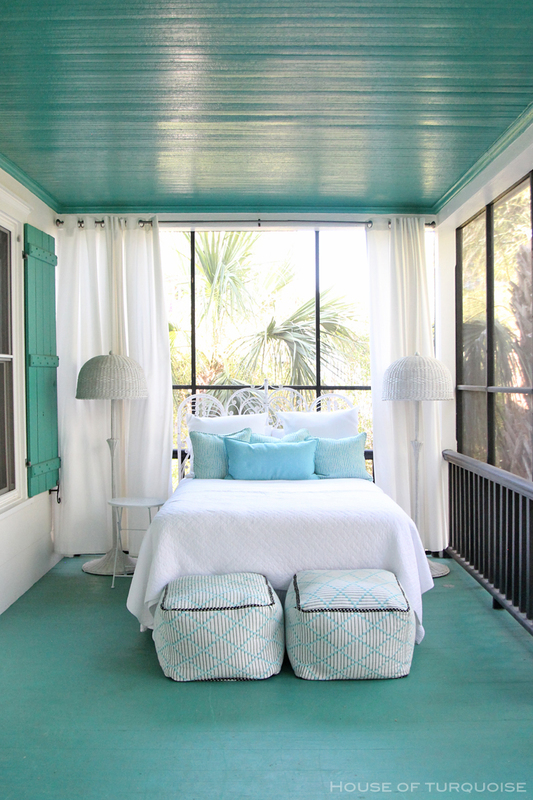 My favorite space in the entire home was this dreamy sleeping porch (painted Albuquerque Teal 607 by Benjamin Moore). 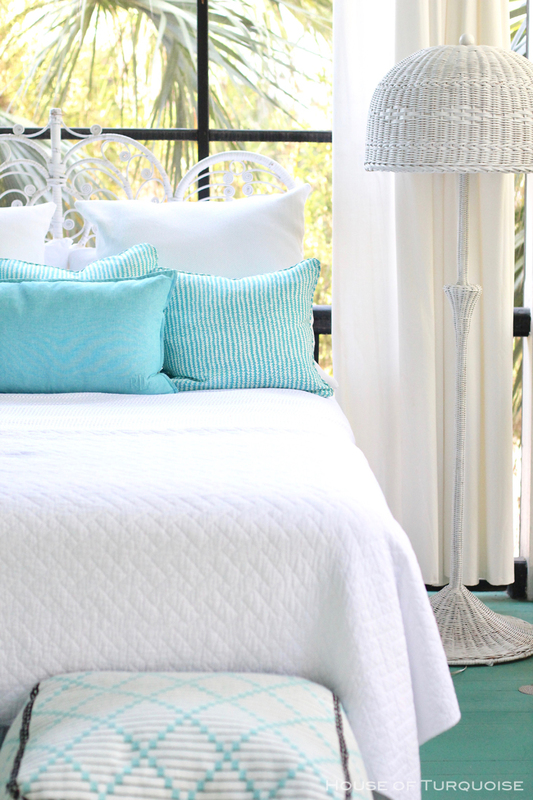 The best spot for a nap with the sea breeze blowing in! 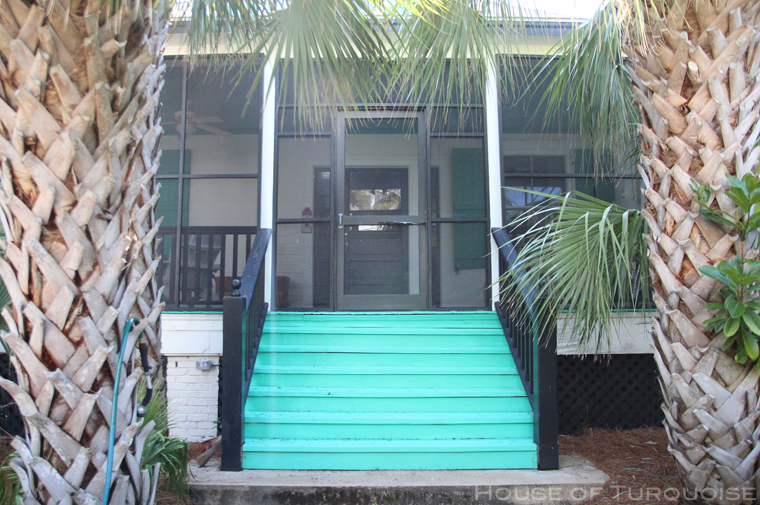 Did I mention the cottage is located just one house away from the beach?! 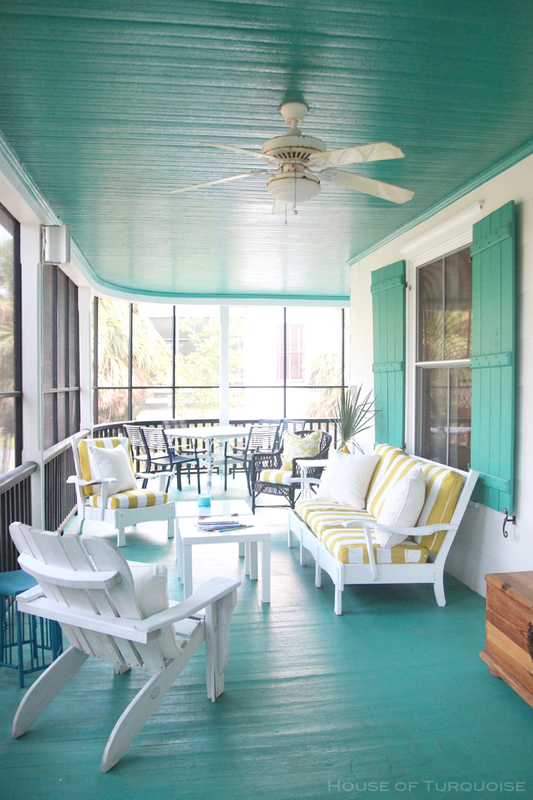 The porch led you into the bright and airy living room. 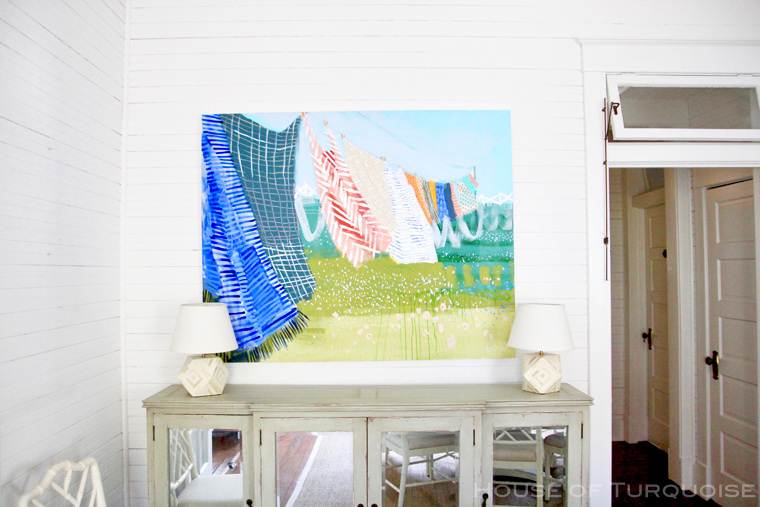 My favorite element here was the original artwork painted by South Carolina artist Susan Skelley. Above it, floral art Jane Coslick found at HomeGoods. 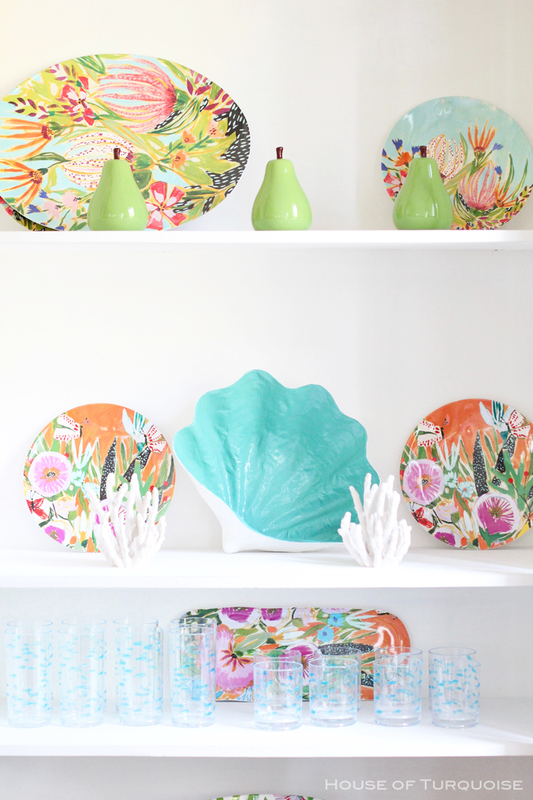 The colors in the landscape art from Pier 1 couldn’t be more perfect. 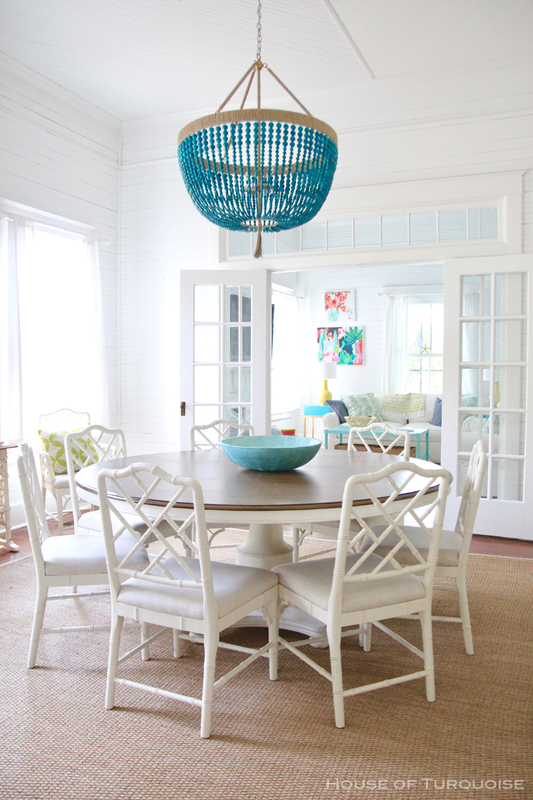 The dining room was another favorite area….what’s not to love about those original windows, the dining table and chairs, and the absolutely fabulous turquoise Ro Sham Beaux chandelier!! I absolutely loved this artwork by the talented Georgia-based artist Elaine Burge, not to mention the Stray Dog Designs mirror below. 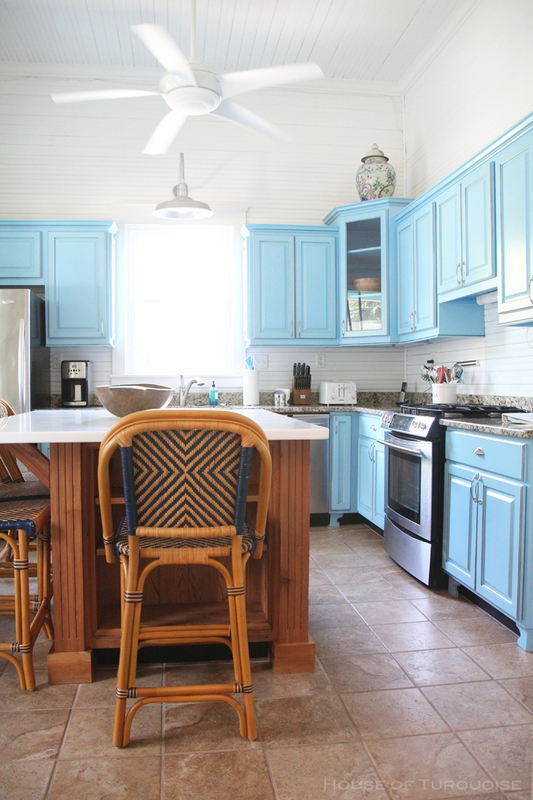 The kitchen brought me back to my childhood and all the time I spent in my grandparents’ century-old farmhouse. The kids loved eating at the big island! 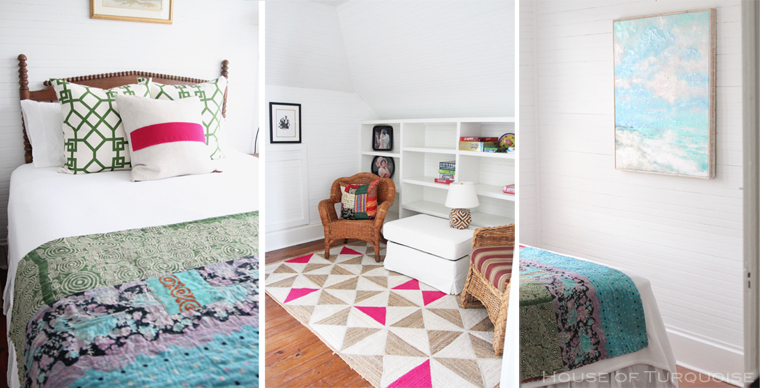 Such a great mix of colors, textures and patterns in the master bedroom. 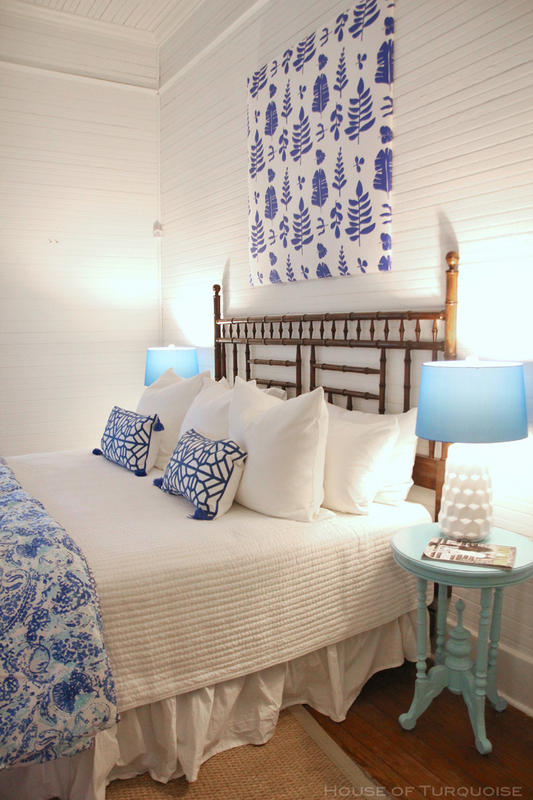 In a genius budget-friendly move, Jane had the artwork above the bed created from a shower curtain! I wanted to take the Poppy and Fritz comforter home with me. And notice the old transom operator on the window….so neat! 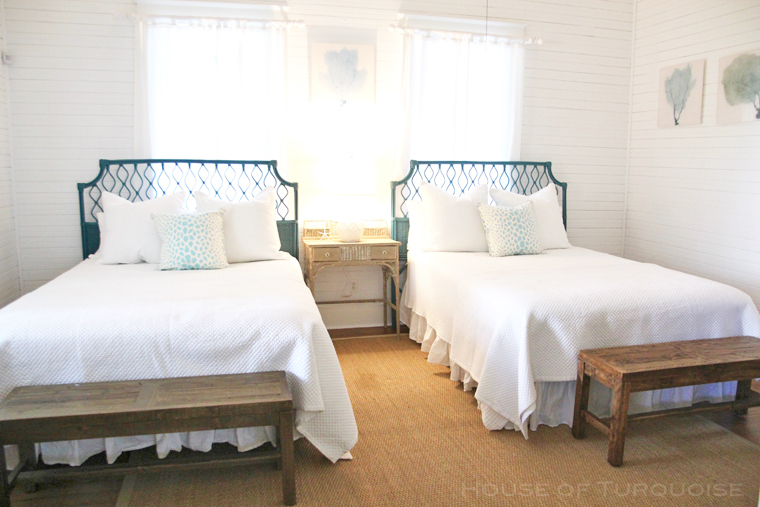 The double queen bedroom had some beautiful, beachy elements. 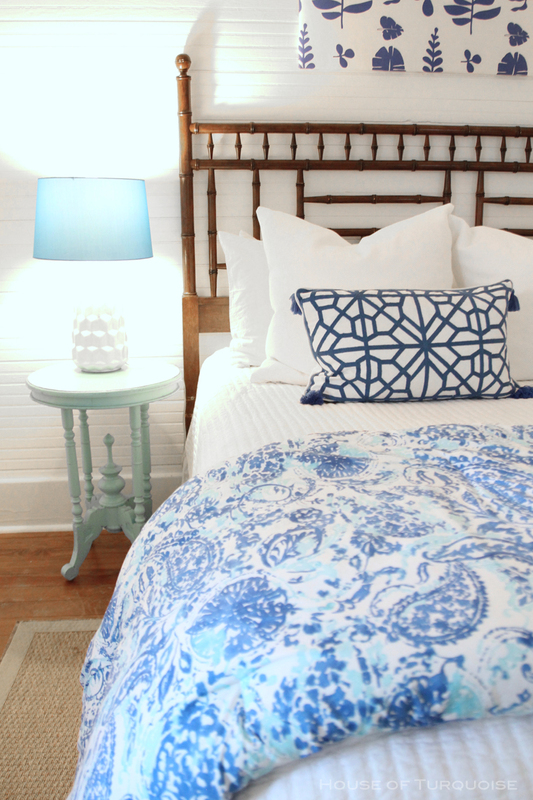 Loving those turquoise wicker headboards! 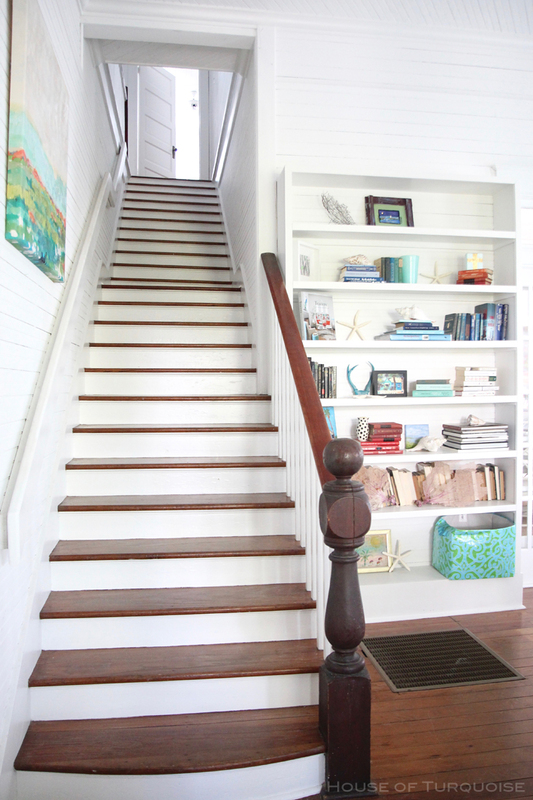 I’ve never seen such a tall staircase–it really goes to show how high the ceilings are. 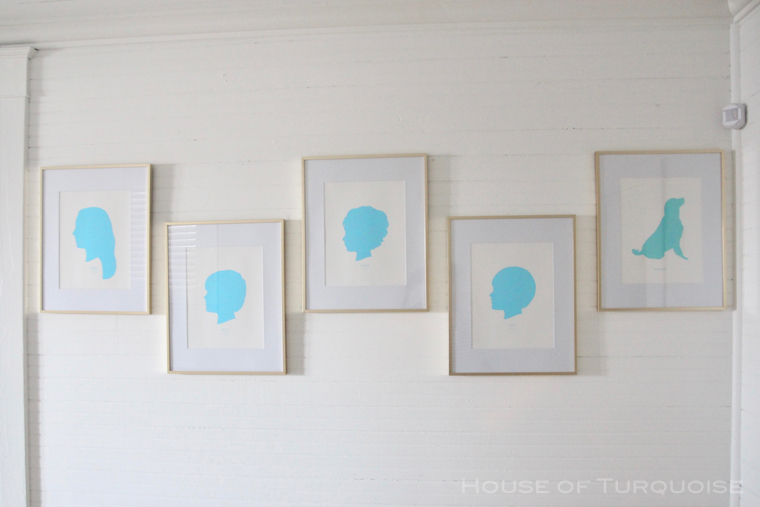 …and these turquoise silhouettes of the family’s littles and pup from Le Papier Studio! 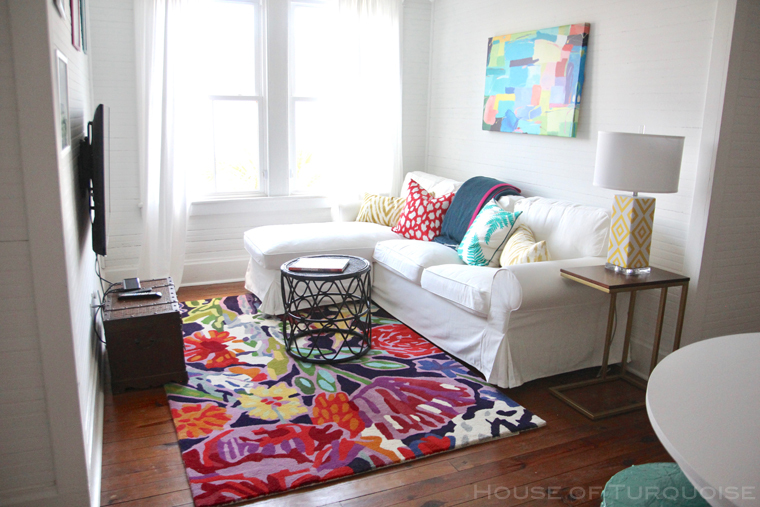 The colorful upstairs TV room was totally up my alley. 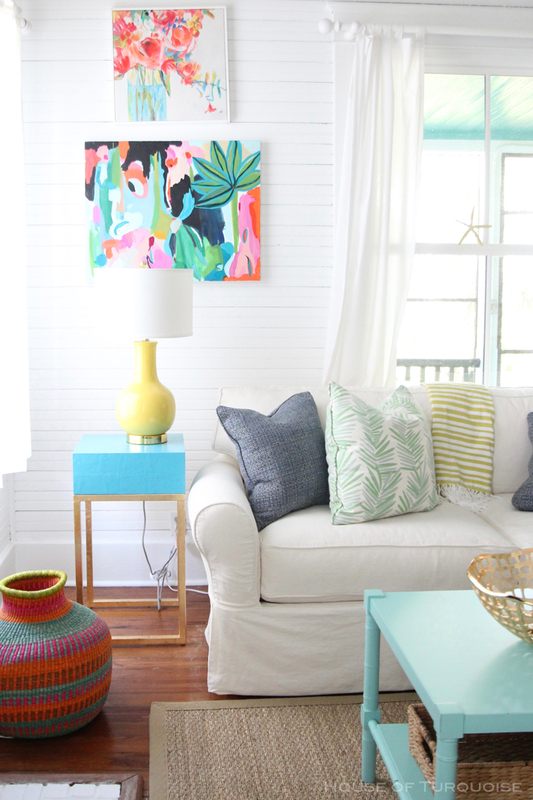 The Anthropologie rug, whimsical artwork and patterned pillows could only be topped by the view of the ocean in the distance! 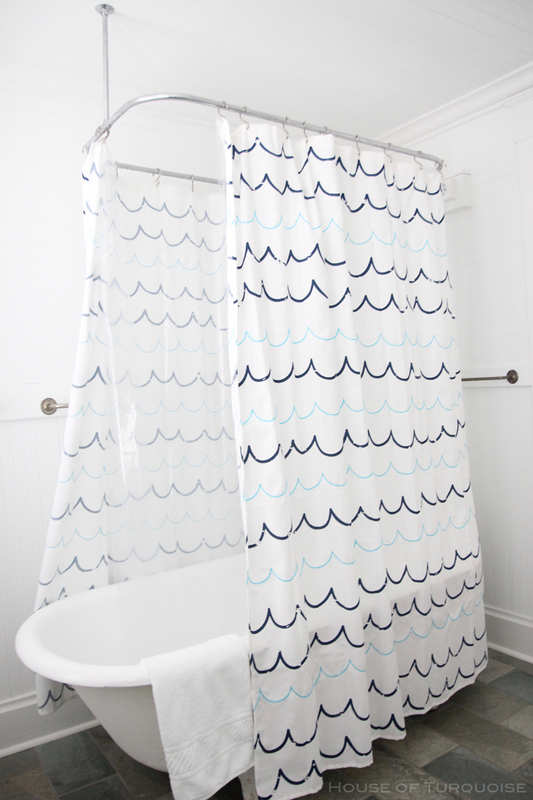 I love how Jane incorporated the children’s art into her design. What a fun place to play games, thanks to Stray Dog Designs! 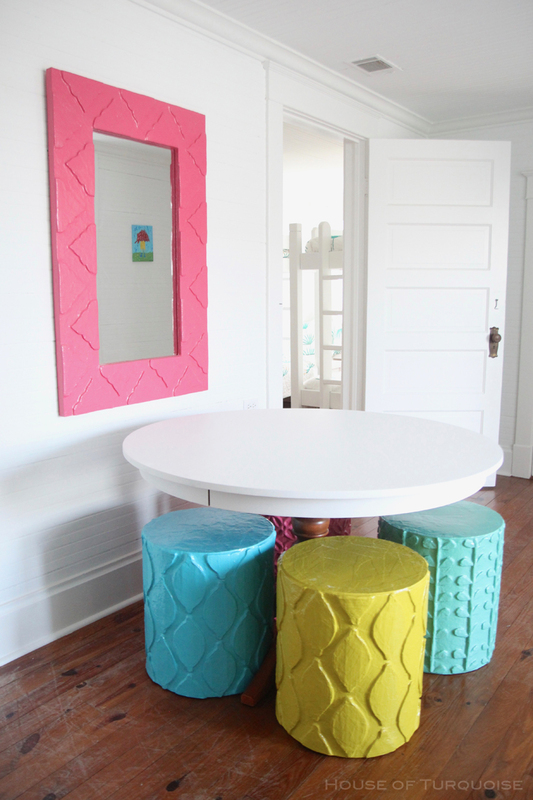 Those stools are awesome! 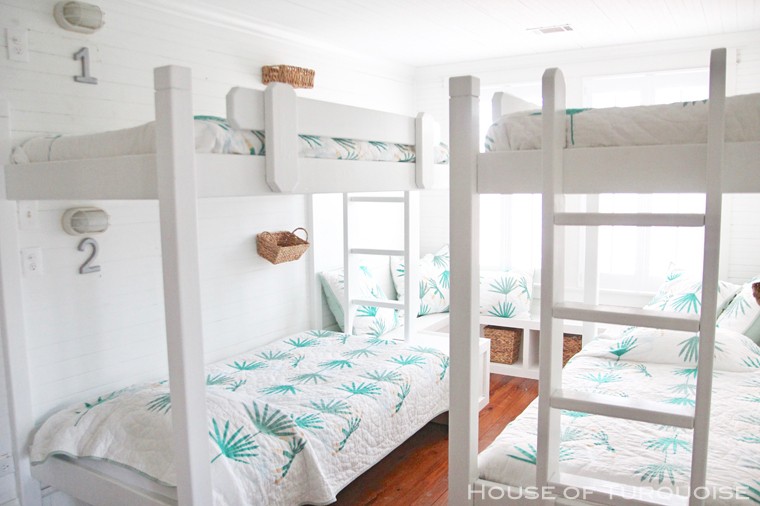 What kid doesn’t love a bunk room?! Each bunk had its own light switch and outlet. 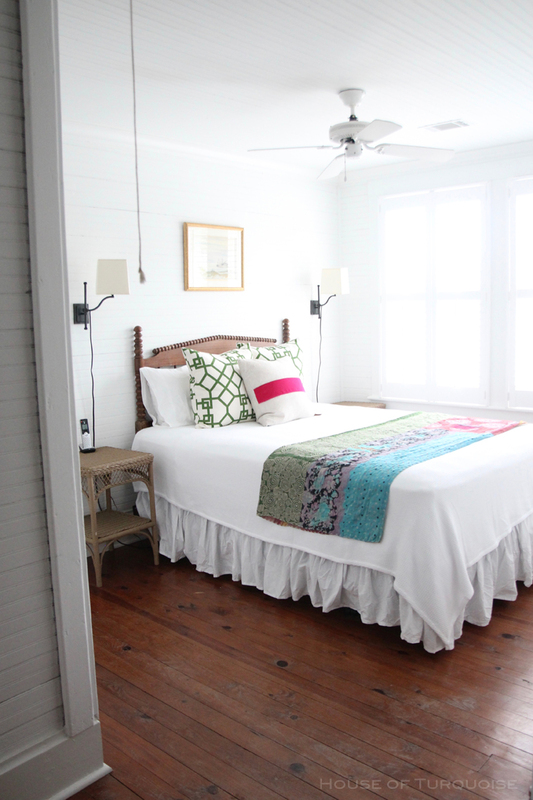 The palm quilts are great too! 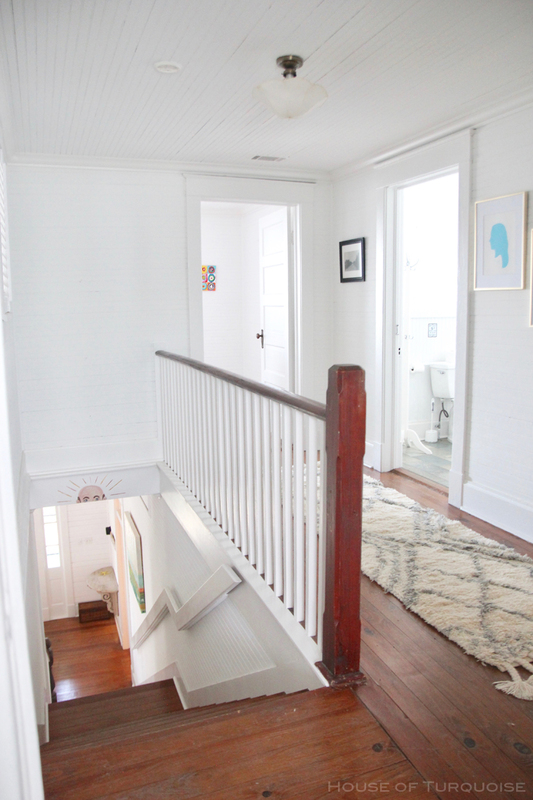 Don’t you seriously love the old hardwood floors? 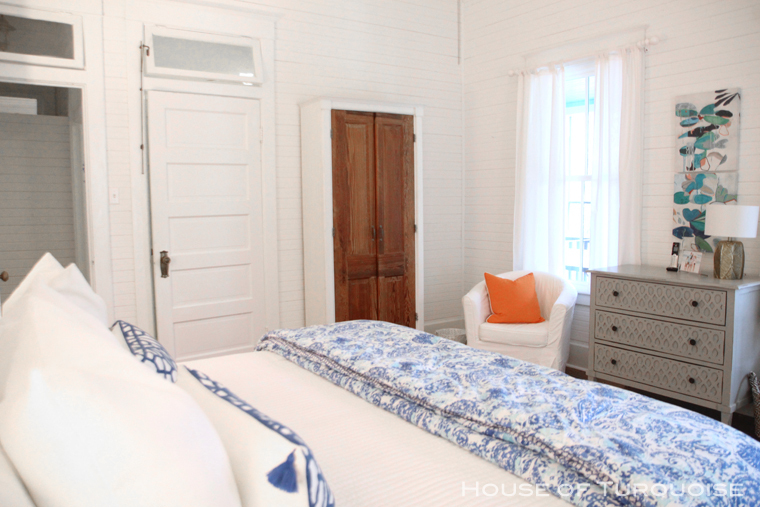 The antique headboard and quilt are beautiful too. 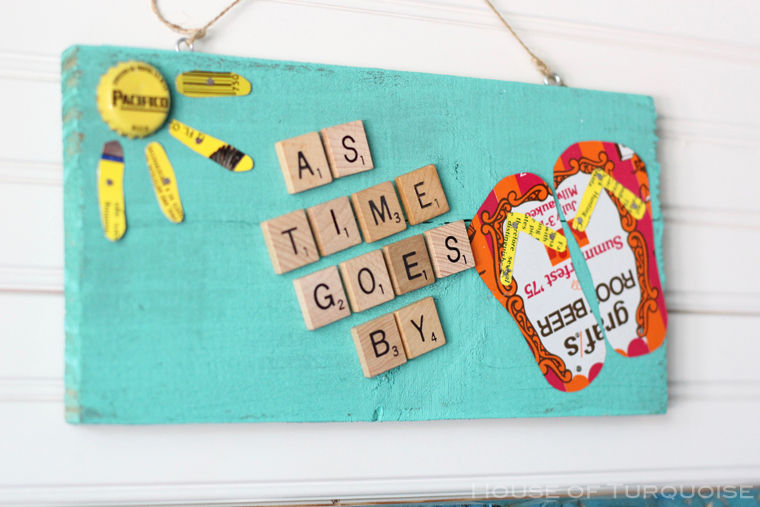 Love this adorable sign created by one of the homeowners’ kiddos. 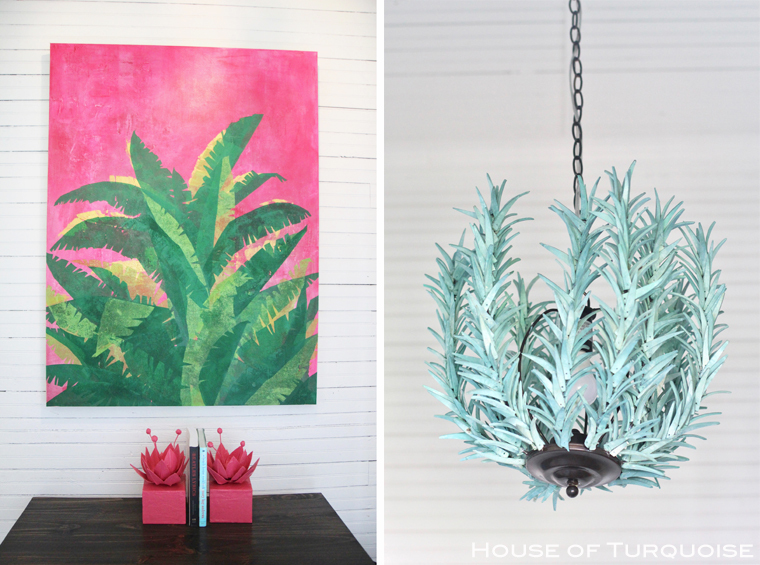 And the tropical artwork by Hilton Head Island, SC-based artist Karley Kiker paired with the unique chandelier! 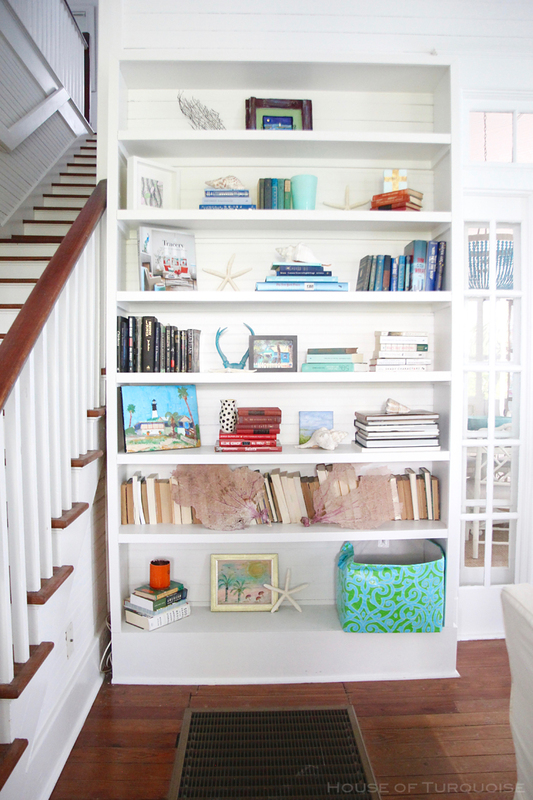 So much room for reading, relaxing or dining. 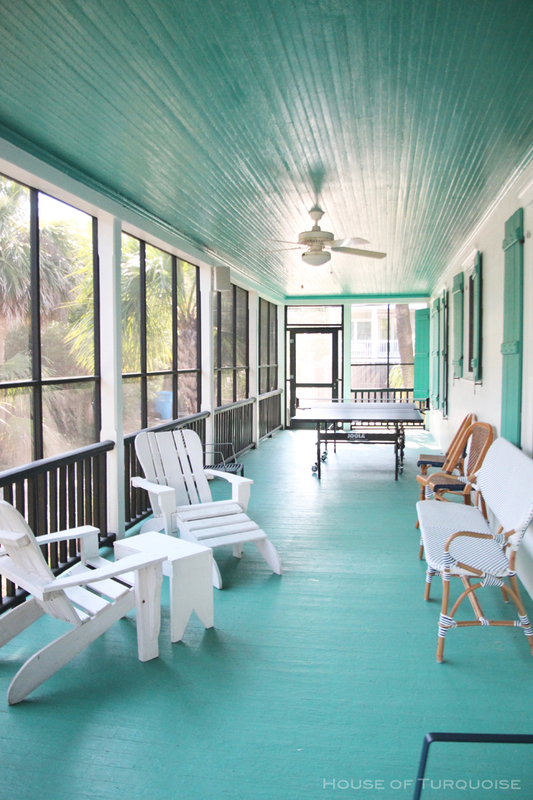 We couldn’t get enough of the ping pong table and outdoor speaker system! Trust me I never wanted to leave! 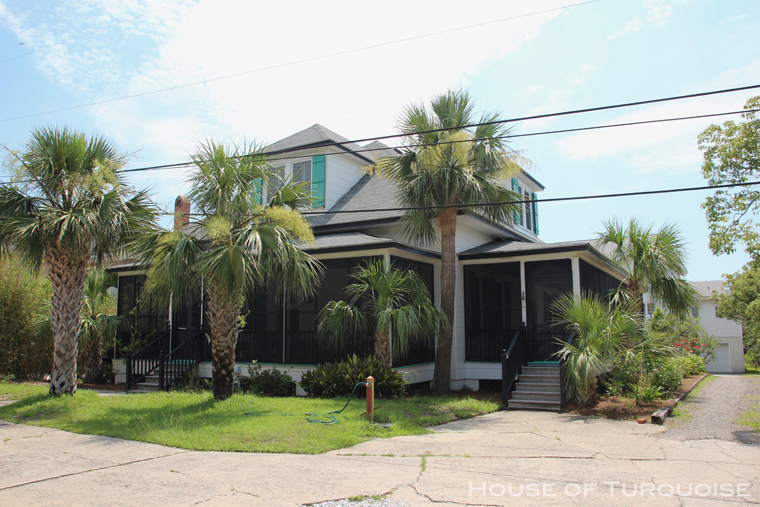 If you’re thinking of visiting Tybee Island (do it! ), I highly recommend checking out As Time Goes By. 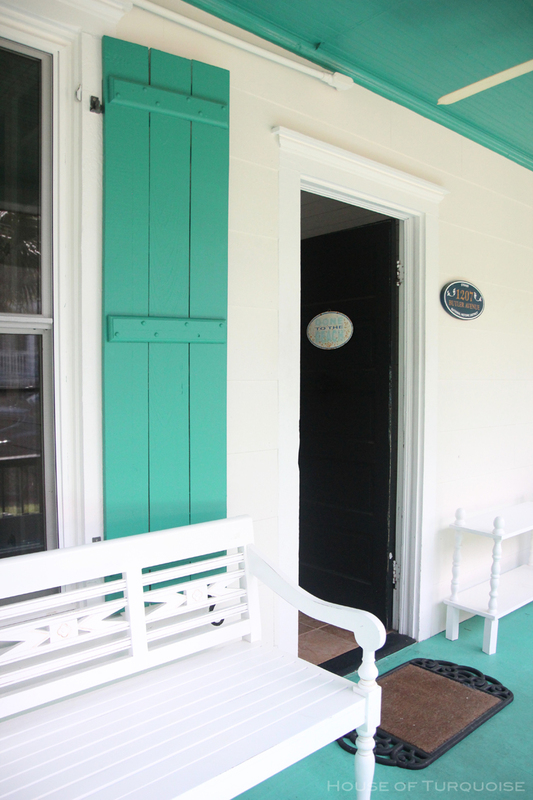 For rental information and more photos, just visit Tybee Cottages. And for even more eye candy and inspiration, be sure to follow As Time Goes By and Jane Coslick on Instagram. 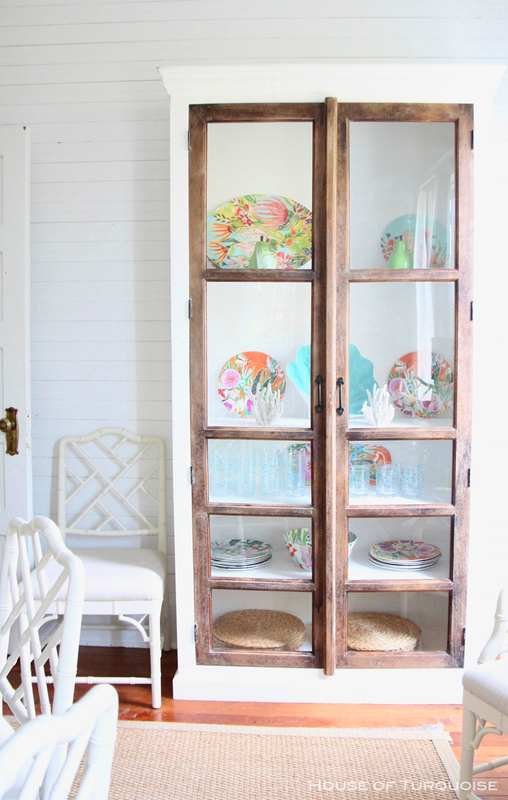 Jane’s blog is one of my favorites too! 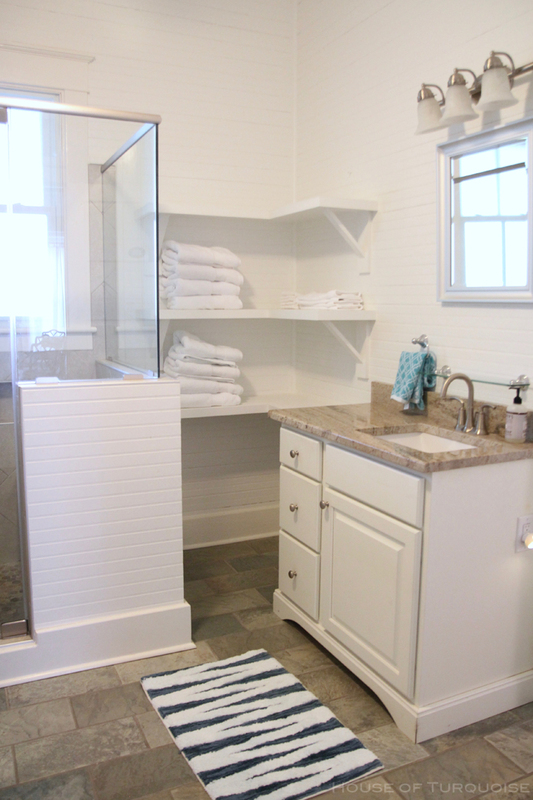 For more Jane Coslick cottages I’ve featured, go here! Wow! What a place. 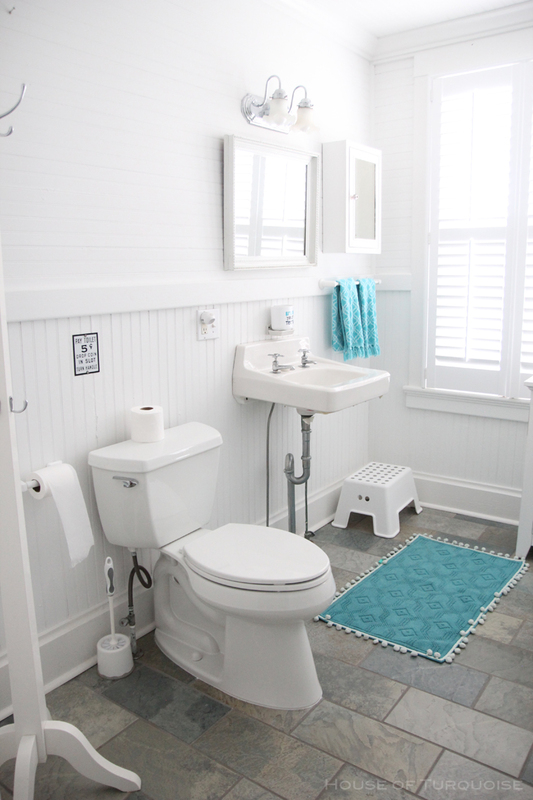 The decor is simply stunning. My husband and I just went to Tybee Island last April. 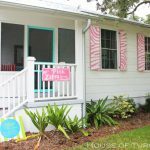 We stayed in Savannah, but we drove around and saw some of these gorgeous homes. Such a charming island. oh my goodness, Erin, this one is a stunner and your descriptions give life to every photograph! 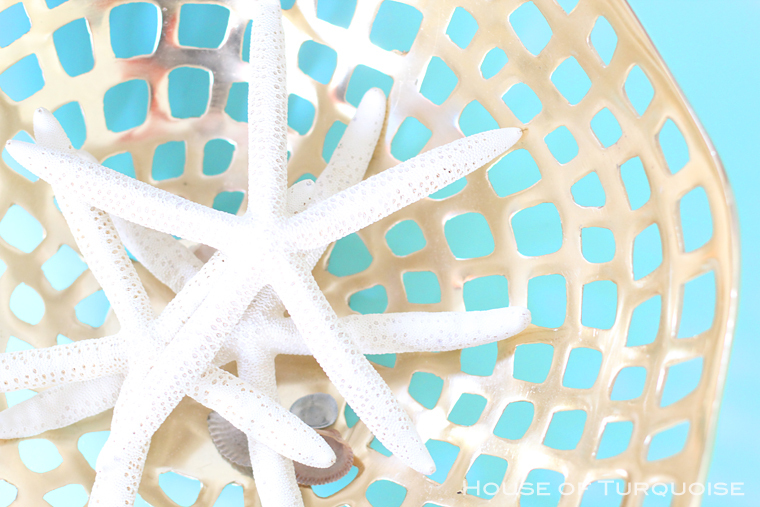 Definitely a turquoise lover’s dream!! so glad you and your family got to go there!! 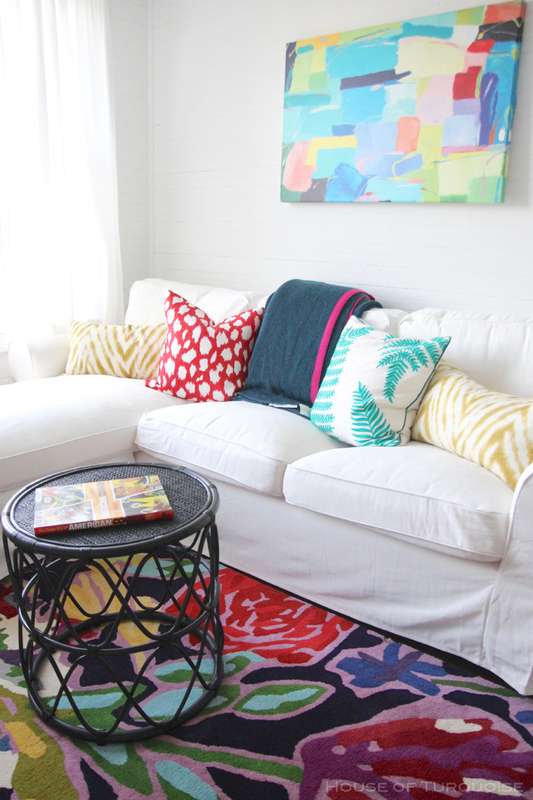 Fresh and colorful home. 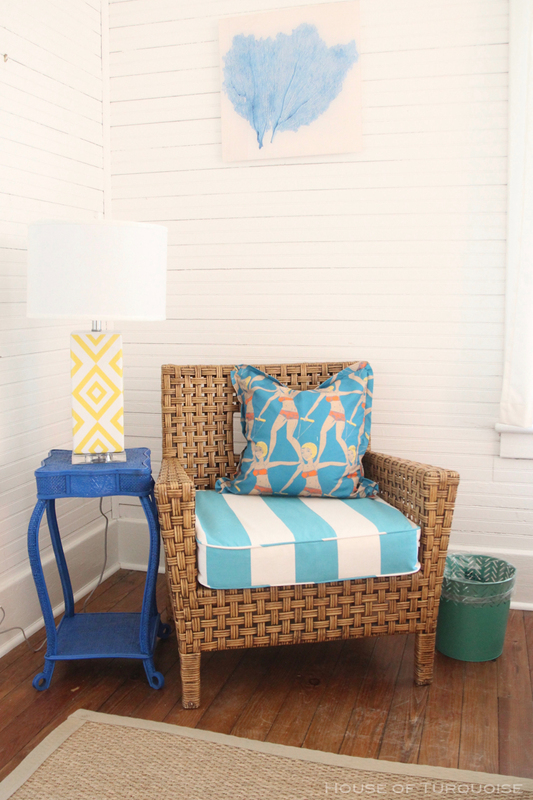 I love your pops of color which is perfect for a coastal Georgia home. 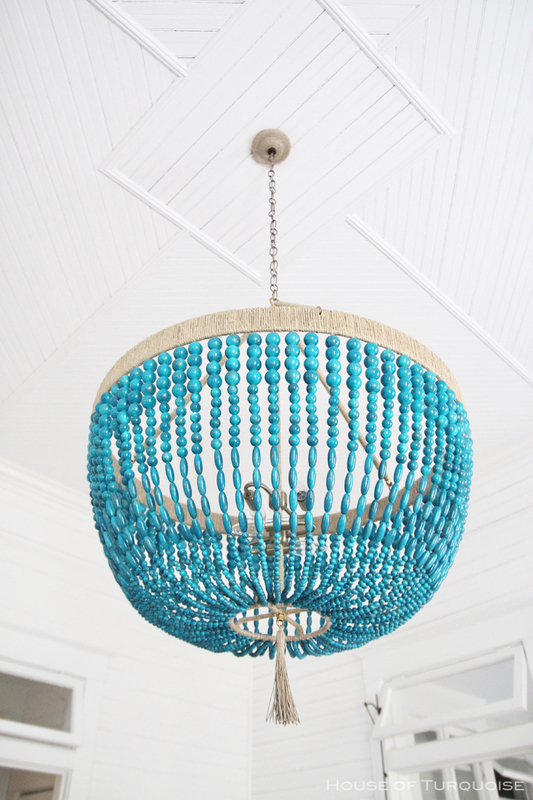 I think I could see our turquoise and jade chandelier fitting in nicely! Thanks for the beautiful photos and inspiration! Karley Kiker is a very talented artist that is worth checking into. 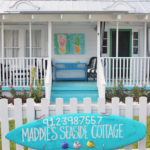 Most don’t know, she is from Texas, but found her inspiration for some beautiful work after she moved to the coast! While some of her TX inspired work, like her pair of boots, are excellent; her art has really blossomed when she met the beach. Search her work out and you will not be disappointed! Wow! It looks gorgeous. Love it. 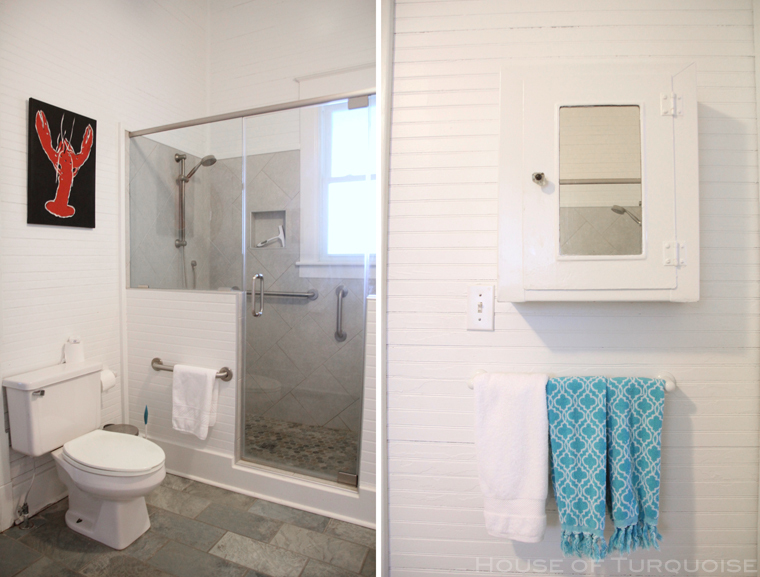 What is the white paint color used throughout the home? 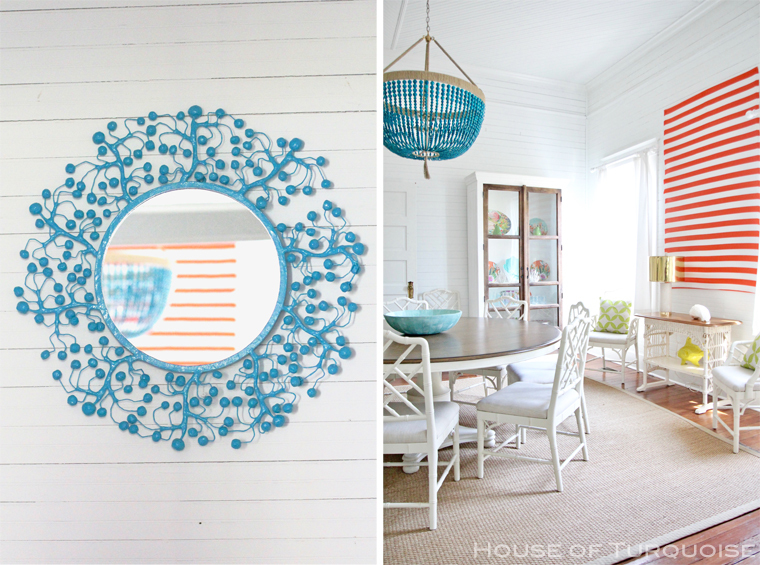 I love the look of the home in every way. The artwork pieces are just perfect. 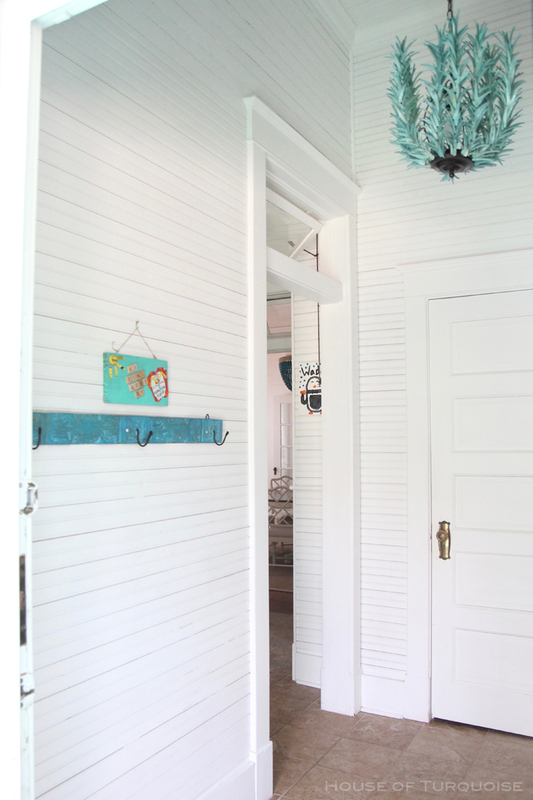 That ceiling with the where the turquoise beaded chandelier hangs is eye-catching! 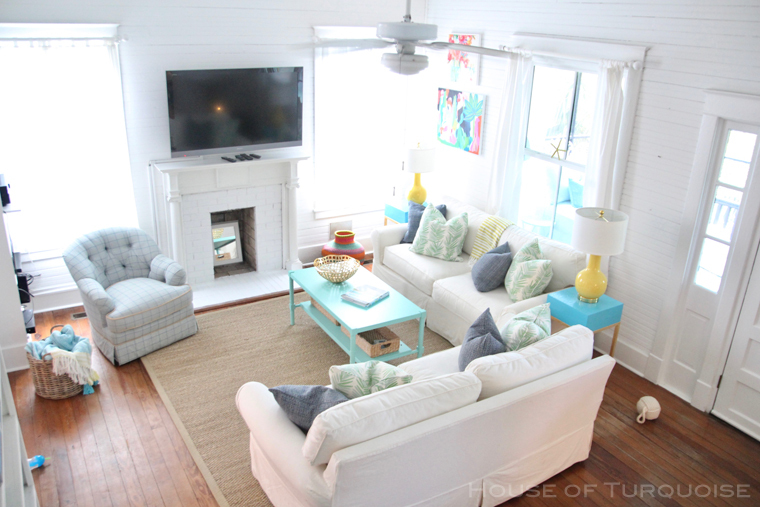 That turquoise ceiling is amazing! I need that in my life. 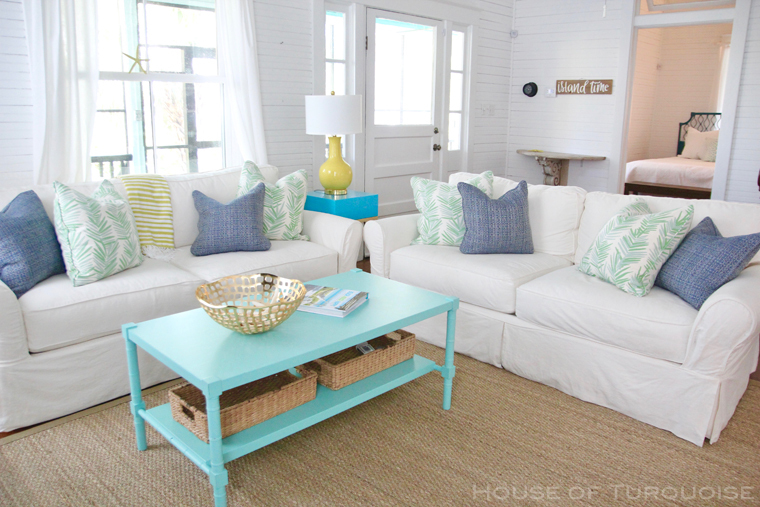 Can you tell me where I can find the white/aqua diamond poufs at the foot of the bed on the porch? Thank you! 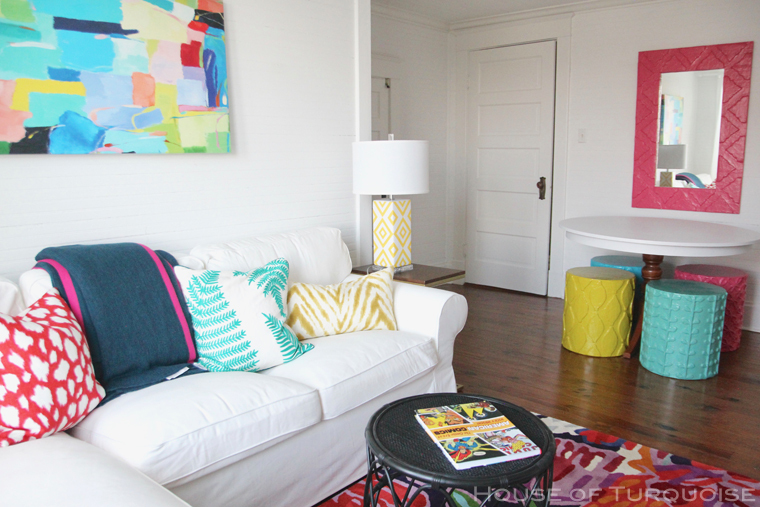 Love the bright and cheerful colors! 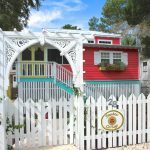 I loved your September post so much, I decided to check out this post too…and what a delightful beach cottage home I found! 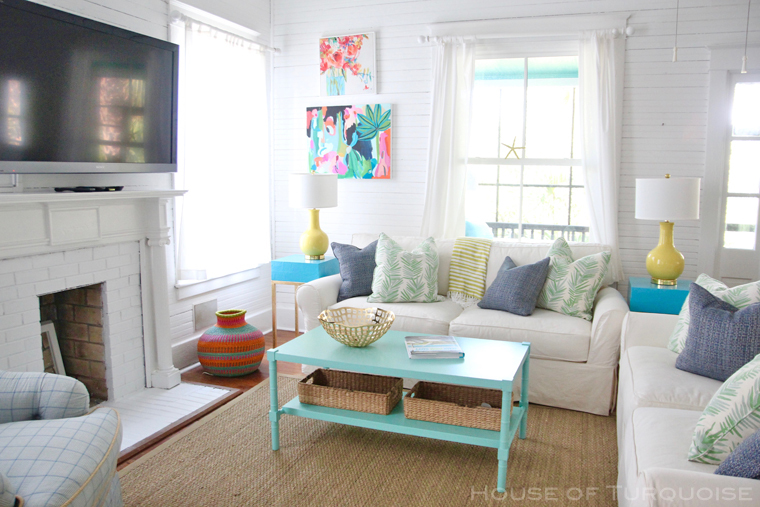 I would love to vacation there as well…I also loved the bright and cheerful flair of this cottage home! Thanks for sharing and inspiring us! That sky blue painting looks brilliant! 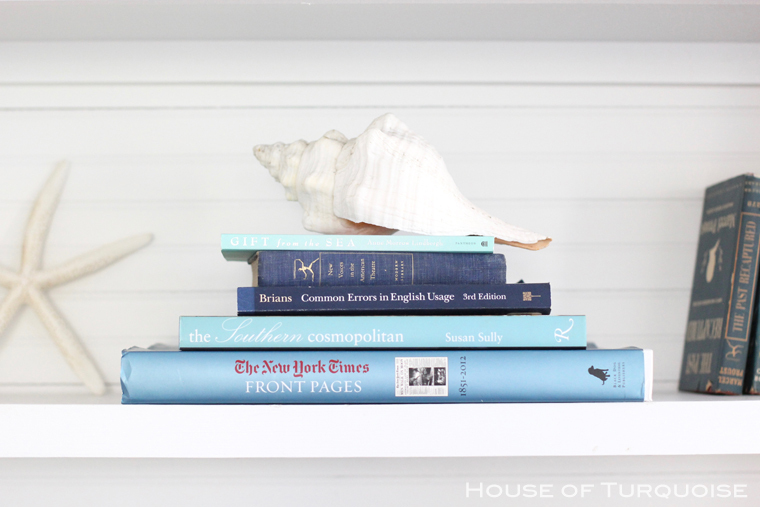 The perfect artwork to complement the turquoise theme.